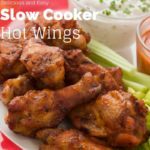 These Slow Cooker Spicy Hot Wings are simply one of the BEST and EASIEST recipes I have ever made. If you are looking for no-fuss but full of flavor, these Crock Pot Chicken Wings are made just for you. I don’t know about you, but I am a BIG fan of hot wings. I love them when they are fresh off of the grill and served on a platter, but since I do most of the cooking, that rarely happens. Instead, you will find this recipe for crock pot chicken wings more often than any other hot wing recipe I make. In Louisiana, we love all things HOT, and this is one of those HOT recipes. So grab yourself a glass of water and start cooking up this perfect game day treat. What Ingredients are needed for Crock Pot Chicken Wings? Here is a quick list of everything you will need. Yes, these are called SPICY hot wings for a reason. I like adding the brown sugar to give them a little sweeter taste, but it’s by far a delicious, spicy hot wing recipe. Mix the brown sugar, crushed garlic, hot sauce, and cayenne pepper into a medium mixing bowl. Mix well and then set aside. Add the wings into the mixing bowl with the spices and toss to give them a good even coat. How long do you cook chicken wings in the crock pot? For fresh, unfrozen wings, place in the slow cooker on low for 4 hours. After 4 hours, remove carefully and place on a prepared cookie sheet. Place in the oven under broiler setting for 4-6 minutes, allowing the wings to get a little crisp. Serve immediately with a little blue cheese dressing and celery. Can I cook frozen chicken wings in the crock pot? You can cook frozen chicken wings in the crock pot but will want to adjust your settings and cook time a little. For frozen wings, I will cook them on high for 2.5-3 hours, and then on low for an additional 2 hours. Looking for more Crock Pot recipes? Check out these CRAZY good slow cooker salsa verde chicken tacos, or these crock pot chicken sliders, or these Ultimate Game Day Chicken Nachos. A spicy Louisiana twist on your favorite game day Hot Wings. Yes, these are called SPICY hot wings for a reason. I like adding the brown sugar to give them a little sweeter taste, but it is by far a delicious spicy recipe more than anything. To get started, mix the brown sugar, crushed garlic, hot sauce, and cayenne pepper into a medium mixing bowl. Mix well and then set aside. Take the wings and add them into the mixing bowl with your spices and toss to get a good even coat over the wings. Place in the slow cooker on low for 4 hours. After 4hours, remove carefully and place on a prepared cookie sheet. Place in the oven under broiler setting for 4-6 minutes, allowing the wings to get a little crisp. Spray the liner and the wings with cooking spray. This helps seal in the flavors. Cook frozen chicken wings in the crock pot for 2.5-3 hours on high, and then on low for an additional 2 hours. 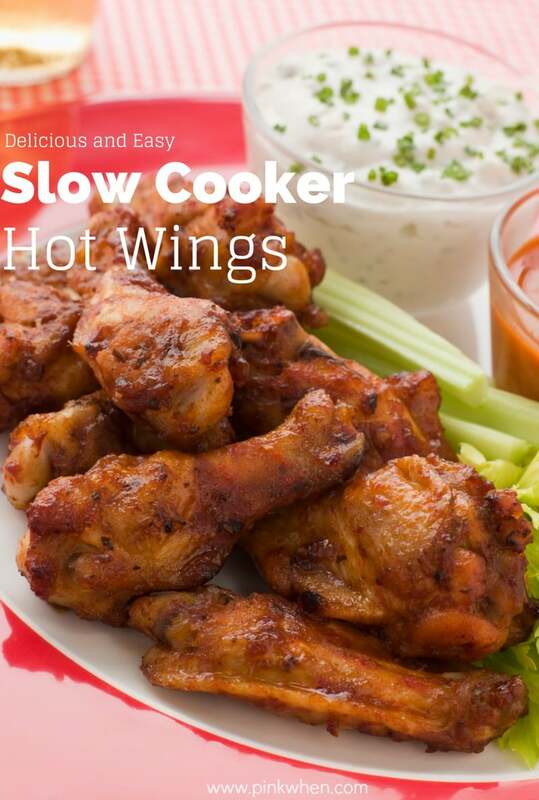 If you are looking for a delicious game day treat with out a lot of fuss, try this Slow Cooker Spicy Hot Wings recipe. It takes minimal effort and is a total crowd pleaser. If you like it HOT, this is the perfect appetizer. I’m not much of a spice person, but I have family members who are, so I’m pinning. I never would have thought to take them out and put them under the broiler — that’s the secret to a crisp wing!! Sadly, I’d probably just sit and eat the blue cheese dressing with a spoon LOL! I can’t do spicy but Cassidy is obsessed with hot wings so I put this on Pinterest just for him. Yum, though. They certainly look delicious. Thank you for the recipe! The wings look very tasty, and I love the spice. You may want to add 4 hours to the total cooking time for using the slow cooker. We love wings, so I will definitely have to try it soon.